Bentley chose to give the Continental GT an overhaul in 2006 when it released the GTC version. While the Bentley Continental GTC shares many technical elements with the standard Continental GT, its soft top status makes it feel airier and more relaxed than its coupe cousin. In 2009, the GTC Speed was introduced, upping the top speed to 200mph and delivering 600bhp, which is 48 more than the standard model. 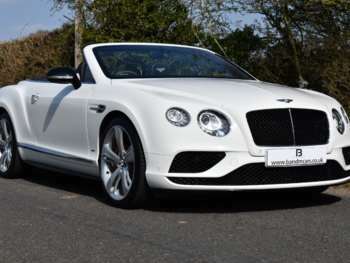 You can pick up a used Bentley Continental GTC for sale in your area, from RAC Cars. With the roof down, you could argue that the Bentley Continental GTC is the best-looking car in its family, outdoing the Continental GT and the saloon stylings of the Flying Spur. It is a car to be noticed in. It takes a little under 25 seconds for the roof to fold away or rise elegantly up to shield you from the elements. Overall, our range of used Bentley Continental GTCs are immaculate on the inside and out, with contemporary technology and classic good looks going hand in hand. The Continental GTC has a four-wheel drive system, but more of the power is put out via the rear wheels to give it a sporty feel without compromising its grip and power in the wet. The automatic gearbox works well on its own, but you change gears using paddles if you want a racier driving experience.